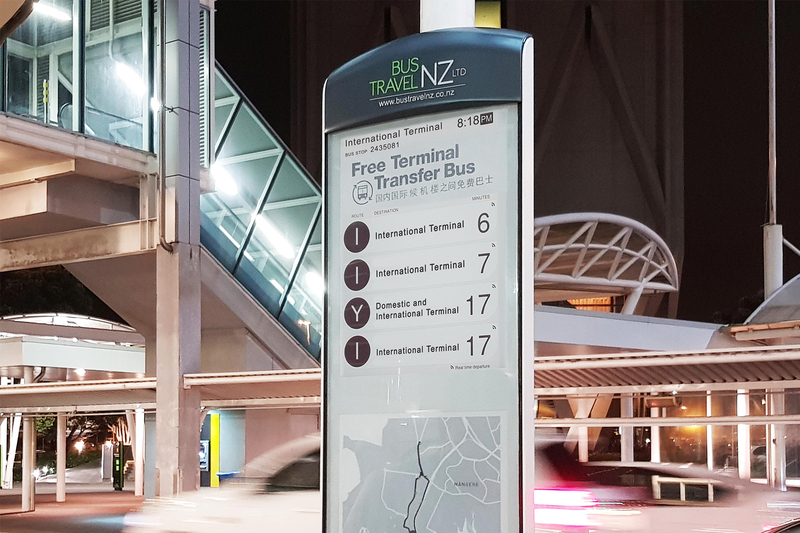 “You shall not wait for the bus in vain!” say the Visionect-powered smart bus signs installed at New Zealand’s Auckland Airport. Travelling to New Zealand? Gandalf quotes and Middle Earth sets aside, there are amazing things to see once you touch down in the Land of the Long White Cloud – among them the smart bus schedules powered by Visionect and designed by Mercury Innovation that greet international visitors upon arrival to Auckland Airport. And there are more being installed as we speak! Auckland connects to 26 domestic and 48 international destinations in North and South America, Asia, Oceania, the Middle East and Europe. The airport saw 10,594,128 international passengers in the year 2017 alone, and has several public transport services that operate to and from the location. In our effort to improve transport efficiency at Auckland Airport and the city as a whole, Visionect and Mercury have teamed up with local partner Radiola Land and have installed Urban signs to say “Kia ora!” and assist visitors to New Zealand when catching a bus. Display important local travel information, among them live airport departures and maps, and provide shuttle location for passengers transferring between terminals. Display bus tracking location on a ‘live map’. Show marketing messages along the bus routes. Provide Park and Ride customers with information on how far away their bus is. Display live updates on the status of the Yellow Bus, the hotel transfer bus. 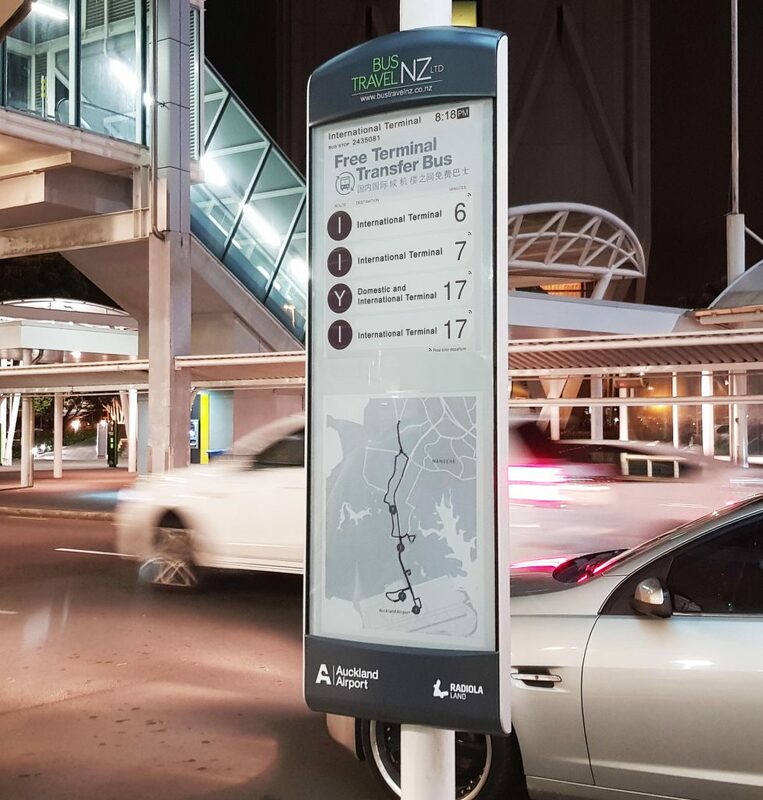 The installation follows the successful deployment in neighbouring Sydney, where Urban signs have been helping public transport commuters both at the airport and the city itself since mid 2018, improving customer service. Running on electronic paper, the text and images displayed on the Urban smart signs are daylight readable, crisp and sharp even in direct sunlight. Important, as their two large, 13.3” tiled screens prove perfect for high-traffic areas where many routes and schedules need to be displayed at the same time. The signs connect via the Wi-Fi or 3G/4G network, making instant, real-time updates a breeze. Utilising a proprietary Digital Dashboard Auckland Airport monitor, the Urban bus stops are managed via a web-based portal accessible on either desktop or mobile devices. The Digital Dashboard is an open platform which allows for the integration of 3rd party API feeds to control and manage all types of in-field devices and technologies, allowing for the management of multiple signage technologies – LED, LCD and e-paper. 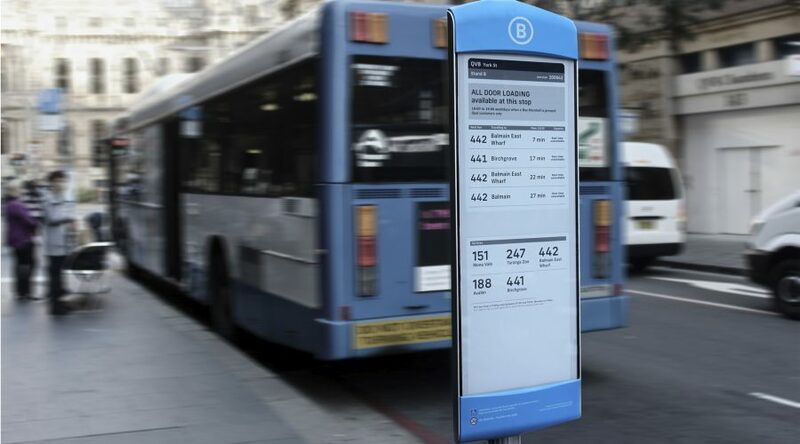 The smart bus stops will also receive input from ground and optical sensors, while the Dashboard will utilize a map-based overview to show accurate GPS locations of all devices within the network, making them simple to manage in real time. Even easier to install. And more coming soon! Best of all: because e-paper uses power only when updating content, the tech behind the Urban screens uses so little energy, it will run on solar power alone. That means no digging and no laying cables. It’s not quite Lord of the Rings magic, but it’s pretty close. And it does not stop there: following the Urban stops already installed is a new deployment of smart Urban with a dual screen signs at Auckland Airport that went live recently. Want to improve public transport in your town also? The Urban e-paper bus stop is available in Visionect’s online store. Choose between Urban with a single 13.3” screen and Urban Dual featuring two tiled screens.